An eruv (plural: eruvin) is a virtually invisible unbroken demarcation of an area. In the Northeastern US, many eruvin specifically use materials that are indistinguishable from the materials commonly found on utility poles. Often, the choice of material is mandated by the utility company. An eruv is required because Jewish law prohibits the carrying or pushing of objects from a “private domain”, such as a home, to the “public domain” on the Sabbath and Yom Kippur. Where are the eruv’s located? 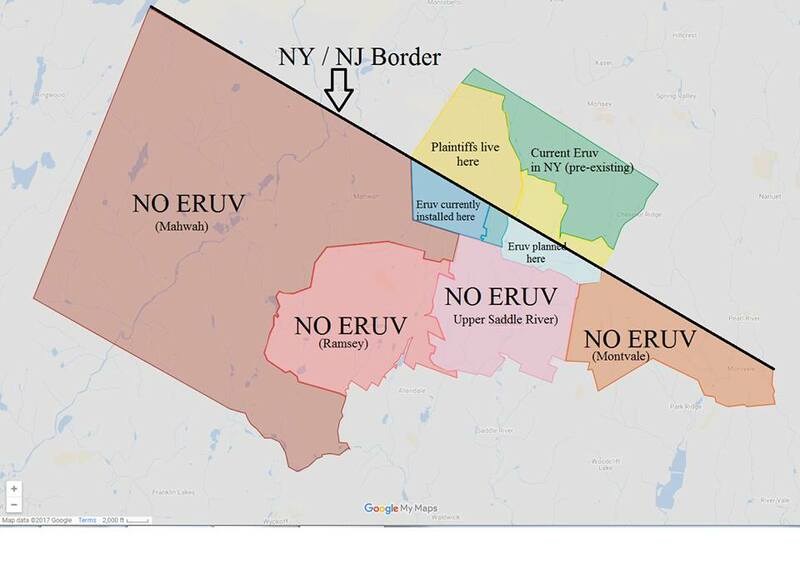 For the current litigation going on in Bergen County, the maps below will indicate the placement of the eruv. In some locations, the eruv was completed prior to litigation commencing and in others, it’s the planned eruv expansion. In this map, the green area is part of the pre-existing NY eruv. The yellow area is the part that was not within the NY eruv boundary the association wished to enclose. The blue area is part of Bergen County where the eruv was placed in order to enclose the NY side. As can be seen in a street map of the designated area (see below), the path chosen by the Eruv Association tracks the first streets in Bergen County running parallel to the border with utility lines to accomplish the goal of enclosing the eruv. Who pays for an eruv? The structures comprising the eruv, as well as its maintenance and upkeep, is funded by the organization constructing it in a particular location. The public does not fund eruvin through taxation. If the eruv makes use of structures (e.g. 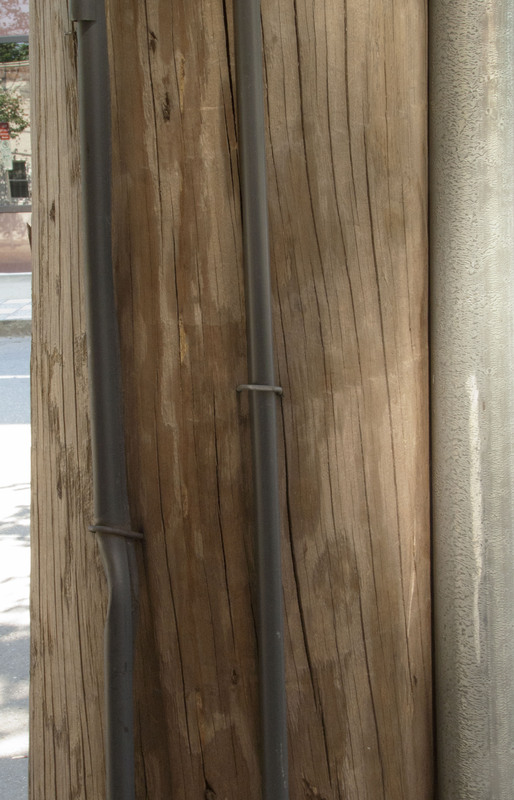 telephone poles used to affix wires or tubing), a fee may be assessed by the owner of the utility poles to the eruv association. Any costs associated with the eruv are paid directly by those who put up the eruv, not passed through to utility customers. How much can eruv lawsuits cost and who pays for them? Court cases to remove or block an eruv installation can be very expensive. The prevailing party in the eruv litigation is entitled to receive attorney’s fees from the losing party. The amount will depend on many factors including the length and complexity of the litigation. In the 6 year Tenafly lawsuit, an agreement was reached for the Township to pay $325,000 to the eruv Association’s attorneys. In addition, the Town also paid the costs of their own counsel, experts and others. In some litigation, such as in the Hamptons cases, the fees were waived by the Town in a settlement permitting the case to end and the eruv to permanently remain. The Mayor of Mahwah, NJ has said that he predicts the Town could face a $10,000,000 bill if the litigation is seen through to the end. Is an eruv a sign? No. 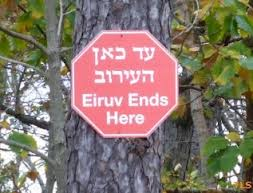 An eruv is a purely functional device that encloses an area, and as opposed to signs, eruvin do not have an expressive component. In fact, many attachments are virtually impossible to spot. Court have reached this conclusion several times. “[T]here is no evidence that Orthodox Jews intend or understand the eruv to communicate any idea or message. Rather, the evidence shows that the eruv–like a fence around a house or the walls forming a synagogue–serves the purely functional purpose of delineating an area within which certain activities are permitted. If you can put up an Eruv, can you put up Crosses or other religious symbols? Not necessarily. Federal Courts governing New Jersey have ruled that an Eruv is not in the same legal category as objects, such as crosses or menorahs, that express a religious message. This issue came up most recently in the opinion the Third Circuit Court of Appeals (which governs New Jersey) decided in the Tenafly litigation. In that opinion, the Court said that the claim an eruv is expressive (like the 18-foot Chanukah menorah at issue in Allegheny County v. Greater Pittsburgh ACLU) was misplaced. Just as someone cannot look at PVC piping used for electrical or other purposes on a home and claim it is a sign, one may not change the ordinary way PVC piping is construed based on their subjective impressions. Does an Eruv in my town violate the separation of Church and State? There is no violation of the the Establishment Clause of the Constitution in permitting an eruv to be placed in the public “right of way”. This is an accommodation under the law, not an endorsement of religion. The items being accommodated are virtually identical and indistinguishable from items found on ordinary utility poles. The Church / State argument has also been litigated at length. In discussing this issue in the Tenafly action, the US Court of Appeals for the Third Circuit said they found the “the Borough’s claim that it can remove the eruv because of its religious nature” to be “unpersuasive”. For a more detailed analysis, you may read the opinion here, which is binding on the Court hearing the lawsuits for USR, Mahwah, Montvale and Jackson. How does an eruv work? Is it a loophole? There is a biblical prohibition not to carry between a private domain (e.g. one’s home) to a public domain (often defined as a space which 600,000 travelers traverse in a single day). As a safeguard against accidentally violating this proscription, Rabbis instituted rules against carrying from areas that are demarcated as private (rashut hayahid) to public area (rashut harabim), and vice-versa. Consequently, Jews observing the laws of Shabbat are not permitted to carry objects from a private to a public domain on the Sabbath and Yom Kippur. However, the same Rabbis that created the safeguard which extended the rules against carrying in this non-private/non-public area (called Karmalit in Hebrew), also created the concept of an eruv which converts the space to a private domain, thus allowing people to carry objects. 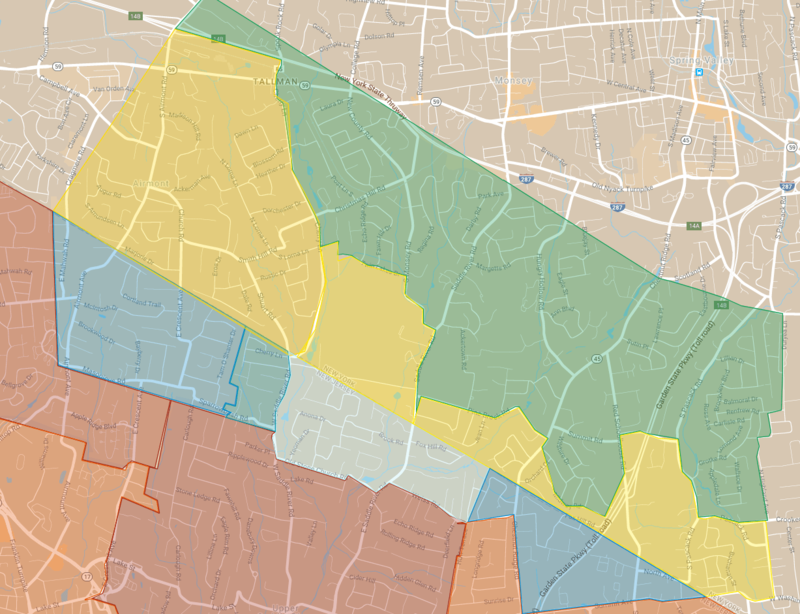 Since the eruv acts as a large private domain, carrying is permitted within the boundaries of the eruv. A popular misconception is that you are not permitted to carry objects on the Sabbath or Yom Kippur and the eruv acts as a “loophole” or “trick”. In fact, the prohibition and the eruv were both created by Rabbis, more than a thousand years ago, in an effort to balance strict adherence with the written law and practical functionality. There are over a thousand years of commentary and rulings on the issue and you can consult your local Rabbinical authority with any specific questions. 50. Al Khazari: Now I wish to ask thee concerning the Eruv, which is one of the licenses of the law of Sabbath. How can we make lawful a thing which God has forbidden by means so paltry and artificial? 51. The Rabbi: Heaven forbid that all those pious men and Sages should concur in untying one of the knots of the divine law. Their intention was to make it tighter and therefore they said: Build a fence round the law. Part of this is the Rabbinic prohibition of carrying things out of private to public ground or vice versa, a prohibition not of Mosaic origin. In constructing this fence they introduced this license, to prevent their religious zeal ranking with the Torah, and at the same time to give people some liberty in moving about. This liberty was gained in a perfectly lawful way and takes the form of the Eruv, which marks a line between what is entirely legal, the fence itself, and the secluded part inside the latter. Why build an eruv in an area with no or few Jewish families? While eruvin are traditionally built within areas where Jewish families live, there are times where the physical structures present make this hard or impossible. In the case of Rockland County, an eruv encompasses the vast majority of areas in which Jewish families reside. To enclose the remaining areas, it was necessary to create an eruv that extended to the closest available utility poles in Bergen County, which can be seen on the map here in blue. How is an eruv constructed? An eruv (technically, an eruv chatzeirot) is a boundary made of natural geographic features (e.g. a cliff), manmade structures (e.g. a wall) or most commonly a series of theoretical doorways which consist of the side posts called “lechis” and the top lintel called “mashkoff”. There is no requirement for the eruv to be particularly visible, so eruvin are often designed to be as unobtrusive as possible. In the Northeast, eruvim are typically established by the attachment of a small string as well as wooden or plastic strips, called “lechis,” to telephone or utility poles. These are the types currently found in Towns such as Englewood, Teaneck, Tenafly and others in Bergen County. Why is an eruv necessary? Based on the sincerely-held religious belief of certain observant Jews, without an eruv, they are unable to push or carry objects outside their homes on the Sabbath and Yom Kippur. As a result, men or women who are confined to wheelchairs or who have small children (or have relatives / guests who are) cannot attend Sabbath and Yom Kippur services or engage in any outside activity or even carry prayer books, keys, reading glasses or medicines. Does the construction of an eruv in my area mean that Orthodox Jews are claiming ownership of my house? No, an eruv affects only an area’s status for the purposes of carrying on the Sabbath and Yom Kippur. This is no different that how every inch of the continental US has been designated part of a specific Catholic diocese, governed by a Bishop for the purposes of Catholic religious observance. Much like the eruv’s “private domain”, being placed in an diocese does not affect you unless you are practicing that particular religion. The use of the term “private domain” when talking about eruvin might cause one think that its construction implies some sort of rights over the properties inside. There is no basis for this view in US law or Jewish law. The class of “domain” here refers to how enclosed an area is, not who has property rights over it. The only function of an eruv is to make an area technically “enclosed” and allow carrying inside it in public places as if it was not the Sabbath or Yom Kippur. An eruv does not give anyone permission to occupy, sell or trespass on another’s private property. There are also those that object to encountering any sort of religious “domain”, but we think it’s apparent that such a designation is entirely imaginary to anyone but Orthodox Jews. Where do eruvs exist and how common are they? A multitude of eruvin have been established nationwide and worldwide. The first documented eruv in the United States was established in 1894 in the city of St. Louis, Missouri. Most recently, eruvin have been established in Plano and Austin, Texas; Scottsdale, Arizona; and Omaha, Nebraska.